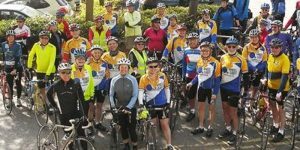 After the success of last years Challenge for Hope Sportive we are doing it again. It’s on Saturday April 14th and will be hosted again by the Dursley Rugby Club, Stinchcombe GL11 6AJ. 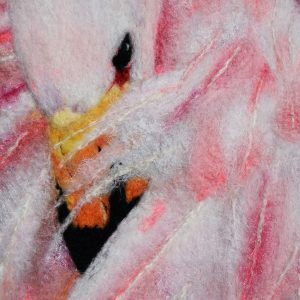 If you would like to enter and/or receive the newsletter just drop me an email to swanwick@stablestudio.co.uk and I will send you all the details. 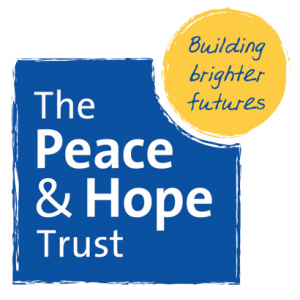 The 2018 cycle sportive is raising funds for the work done in Bluefields Nicaragua by The Peace and Hope Trust. http://peaceandhope.org.uk The people of this very poor town in the poorest country in Central America need all the help they can get. The Peace and Hope Trust does a great deal of work building schools, clinics and skill centres. They also set up and aid local projects to train unemployed people, feed children who would otherwise be malnourished and help protect vulnerable young people from exploitation. Education is key to breaking the cycle of poverty and the trust does all it can to get the poorest children into education in schools fit for purpose. They send out several containers each year full of donated equipment and materials for schools, clinics and hospitals in Bluefields. 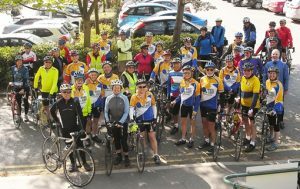 After the success of last two year’s event, from which we raised over £7,000, we are hoping for an even greater turnout for this year’s ride. The 25, 40 and 70 mile rides will be fully way-marked with free refreshments on all the routes. There will be bacon butties to get you going and a bar and barbecue on your return. 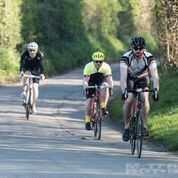 The start and finish is kindly hosted by Dursley Rugby Club in Stinchcombe GL11 6AJ and the new routes will take you through some of Gloucestershire’s most peaceful lanes. There are a couple of challenging hills on the 70 mile run but the 25 & 40 mile rides are relatively flat this year. Please email me at swanwick@stablestudio.co.uk and I will send you all the details and an entry form. 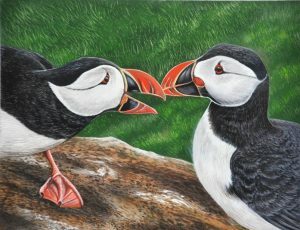 Just one of the bird paintings I will be offering during the Tyndale Arts Week in the exhibition space at Dursley Tabernacle Community Rooms. Saturday 7th October 10am to 6pm Sunday 8th October 10am to 4pm. This is a new event and we are all very excited but wondering if the word will get out so it would be great if you could spread the word. There is some wonderful work on offer so it would be a shame if no one got to see it. A few of us will be working all day during the show so you are very welcome to come and chat. Our last stop was at Laguna De Apoyo which is a nature reserve, in the middle of the country. The reserve surrounds an extinct volcano filled with fresh water. Casa Bella, a small boutique hotel, was the perfect place to end our trip. 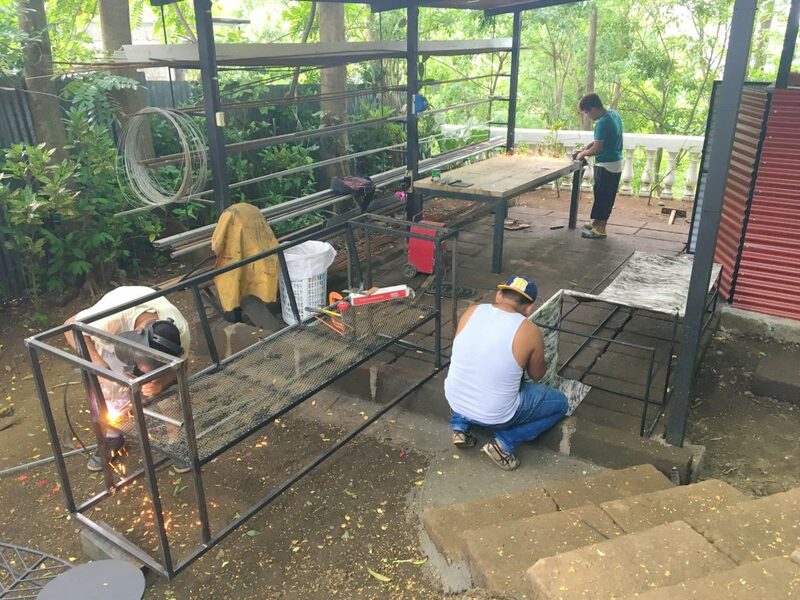 Laguna De Apoyo is an idyllic spot for the visiting tourists but in the surrounding forests are a few villages housing people in very basic accommodation who live very hand to mouth lives. Isabell Junod (Bella), a Swiss national, came to visit Laguna De Apoyo two and half years ago and fell in love with the place, decided to buy a derelict building plot and develop her own unique little boutique hotel. In order to do this she enlisted the help of a handful of local people and with very rudimentary Spanish she set about building her dream hotel. Now I won’t bore you with all the details of the ups and downs of this two year project but suffice it to say this is an extraordinary woman who won the hearts and minds of the local people for her hard working attitude, tenacity and team building attitude. She had a vision but was always open to advice and ideas from her co-workers and so won their love and respect. 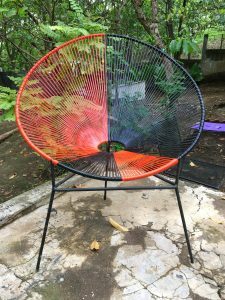 When the project was completed she returned to Switzerland for three months in order to do some contract work (she is a highly regarded project manager in Switzerland) and this is the way she earns the money to put into her Nicaraguan dream. She is of course now fluent in Spanish and so you can imagine her distress when she returned to Laguna to find the workers in the village were now destitute because having given her their undivided attention for two years they were finding it almost impossible to find new work as they had lost all their network of contacts and work is not that plentiful anyway. She immediately went out and bought rice, beans and other much needed provisions to make sure no one starved but of course she could not provide endless charity and the families did not want to be dependent on her either and so after some serious discussions they hatched a plan! Bella rented an empty house in the village with a sizable yard for a peppercorn rent from a lady who had inherited the house when her mother died. She and the team then set about reshaping and decorating the house to make it into a showroom for the household furniture they intended to make. They built storage space and a workshop in the yard and created a garden show-space for the garden furniture. They are now working hard on prototypes of the furniture and Bella is going around hotels and other establishments generating a market for their creations. Bella has spent a lot of her own money already on this project, even paying the team a small wage although they are not producing any saleable goods yet. They desperately need a £2,000 injection of capital in order to fund a direct 200 volts electricity supply (at the moment they have 110 volts and when they use the welder all the lights in the village go dim) and they need two more pieces of equipment in order to improve their productivity and this is where you can help. For my part I am auctioning one of my best paintings. 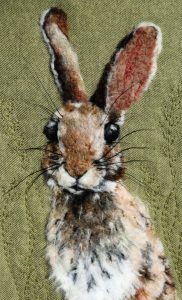 This is a work I would expect to get at least £800 for and in a gallery it would be £1,600 with their commission added. I will put all the money I get for the painting into the fund. If you are interested in bidding then email me with your offer. The auction will close on the 30th of August. 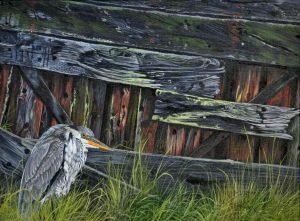 Auction painting. 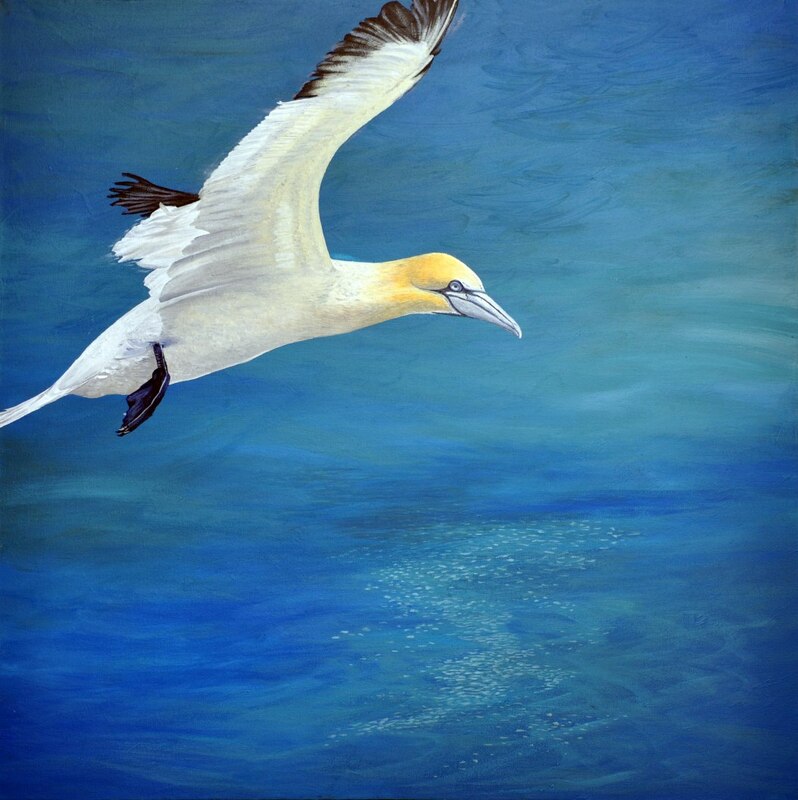 Gannet 24″x24″ oil on box canvas. This is the perfect example of “Give a man a fish and you feed him for a day. Give him a boat and a net and you feed him and his family for a life time”. To give you some idea of the impact of this project on the local community the six men involved support another forty nine people, wives, children and parents. Four of the six are illiterate because they received no education to speak of due to the civil war, but now they realize how important it is and want to learn and so the older people who can read and write have set up a self-help group and are teaching all the young men and women in their late twenties and early thirties who want to learn. Three of the team working in the new covered workshop space. They now have hope and won’t turn to drugs, gangs and crime. If you are able please go to my crowd funding appeal and make a contribution to help Bella and the team get properly connected to the mains, purchase a pipe bender and a second welding machine. I am hoping you will seriously consider donating the price you would usually pay for a night out at your favourite restaurant. The effect of that one contribution of one night out will be enormous for these families. Nicaragua is now stable and beginning to prosper. This project has tremendous potential, please help them to succeed.